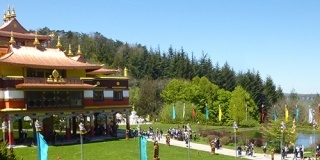 In one of the most beautiful and natural environments northwest of Montpellier in France, you can find a magnificent temple, which is at the heart of the Tibetan Buddhist Retreat Centre, Lerab Ling. 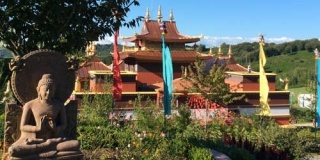 In all aspects, the temple is inspired by the art and architecture of ancient Tibetan Buddhist monasteries in the Himalayas. Inside the temple is a 7-meter high statue of the Buddha as well as many authentic paintings and statues. NEW ! 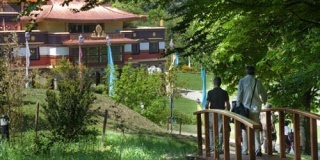 - You can do a self guided visit using your mobile phone (available in French, German and Spanish). Click to download the application. Sunday Afternoon visits - On Sunday afternoons only from 2pm to 5pm. Guided Group Visits - Upon request only (at least 14 days ahead) from Monday to Saturday.